How do you know it's not Pickled Himming? Presentation vibes to DR Ben! It's a busy programming day in the Foundation Center universe - I'm hosting my monthly brownbag lunch for nonprofit folks. It is not a bad show then then again NBC is in dismal shape. It would nice for it to got there if NBC did not pick it up. DR der Brucer is in rare form today. The WOD is encouraging him entirely too much! Yes, sir. Would you care for John Wilkes, Edwin or Shirley? Gotta love it when others help make you look good! Broken leg vibes to DR Ben for the presentation! Singdaw, have you ever done theatre? Wish I was in LA so I could see Matt's play at UCLA. have you ever done theatre? Of the Absurd? All the time! I have done many musicals, but nothing very recently. I would write a ditty about Mt. Etna, but what rhymes with Etna? Imagine the PMS before this episode! Imagimne the PMS before this episode! So you like, maybe, some Kippers? 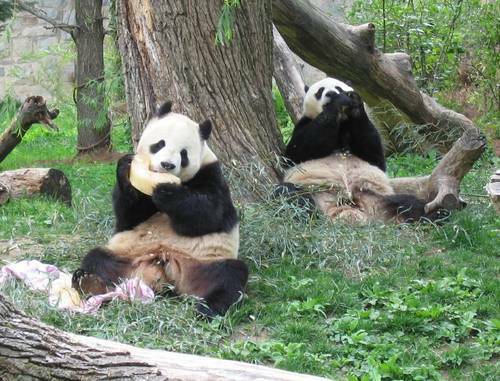 Time for a panda nosh! They could shoot an alternate ending for Rebel Without a Cause! Legs akimbo! - Not very ladylike! Wilbur Turnblad for three months. This will be the Beev’s Broadway debut. Eagarly awaiting the Variety "Beaver Back on Broadway" headlines. Now Fred will post: "I didn't know it ever left!" Well, gang, for once the vibes didn't work. My presentation is cancelled today. We had an electrical fire in one of the HVAC rooms on the second floor (that's where my presentation was happening). The fire alarm blew just as we were supposed to begin. The acrid smell of electrical wires burning (and that piercing fire alarm and strobe light) sent everyone out of the room. The presentation has been postponed until the week of May 21 (since I'm on vacation all next week). Perhaps the vibes did work in a funny way because yesterday was the less than professional presentation and some people asked me guarded questions about my dog and pony show in a way that made me think they didn't want to sit through another one of these things. In two weeks Mr. Charm will be a memory (in presentation terms at least) and I will start with a clean slate! The fire alarm blew just as we were supposed to begin. The acrid smell of electrical wires burning sent (and that piercing fire alarm and strobe light) sent everyone out of the room. Your version of a Merman entry? DR Ben - With your acting background and grandly resonant speaking voice, I don't think you can help but be charming, yourself! Does anyone have the book of the vocal selections to the "complete" Follies. I am interested in the lyrics to The World Is Full of Boys/Girls. If you don't want to post here you can private message me. The reason is I would like to know if the lyrics used (in French) for the Operetta track from Stavisky were translated or new lyrics by someone else. DR Michael S - I have this. Somewhere. Perhaps I can find it when I get home today. A mixture of clouds and sun today, and temps in the 70s today too as we begin a gradual warming trend the rest of the week. Should be summery again by the weekend. You did, but I certainly agree! And speaking of Seeley Booth, I noticed in TV GUIDE that next week will be the season finale of BONES meaning that they aren't going to show that episode that got canceled after the Virginia Tech massacre. I can't imagine that they'd just junk it, so I wonder if it'll be saved for next season. I think there were some Hodgins/Angela scenes that'd have to be reshot since they're getting married next week. If they don't junk it, perhaps it will turn up in the DVD set.